There’s a new proposal at stackexchange.com for a Q&A site on Mathematics Learning, Studying, and Education. Of course the entire mathtwitterblogosphere is a massive Q&A site on Mathematics Learning, Studying, and Education. But based on my experience of the incredible usefulness of the StackExchange sites Math StackExchange and MathOverflow, I think this site could become a great resource. Possibly also a great forum for some much-needed productive dialogue between the K-12 and collegiate levels. For that to happen, though, it needs you. 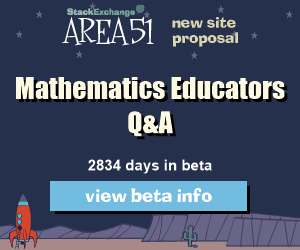 The bulk of the folks currently signed up for the beta of the new site are active on Math StackExchange and MathOverflow, which are dominated by college-and-up level math. The conversation is going to be so much richer with serious K-12 representation! Go sign up! If you haven’t heard of the StackExchange sites before, they are a very thoughtfully constructed Q&A structure. It all started with StackOverflow, which was for working programmers to ask and answer practical coding questions. MathOverflow copied this idea for working research mathematicians. Math StackExchange is in principle for Q&A about math at any level, although as I mentioned, in practice it’s usually (though not always) about college and graduate level. Now there are also StackExchange sites on cooking, gaming, English language learning, and a million other things. The design of the software, and the culture of the sites, do an impressive job keeping the Q&A productive and on topic. (B) Bull-guard the considerable stash of privilege that accrues from its high intellectual status. (More on this in future posts.) The incredible usefulness of the sites makes it worth it; but also, this is part of why I want you guys to go populate the new Math Education site. You are clear in your hearts that math is for everybody. This is our chance to go talk with some folks who represent a culture that is working through that for itself. Meanwhile, we get to benefit from their perspectives, which have seen very different parts of the mathematical kingdom in their travels. Disclaimer: I think lots and lots of individuals on Math.SE and MO think math is for everybody. I am not trying to stereotype the sites or mathematicians more generally. And I think it’s likely that the people from Math.SE and MO who gravitate to the new Math Learning/Education site are going to be skewed toward the folks who think that math is for everybody. What I am trying to do is to name some notes that I hear in the cultural soundscape of academic math as a whole, and Math StackExchange and MathOverflow in particular; but I’m not trying to identify those notes with any individuals.